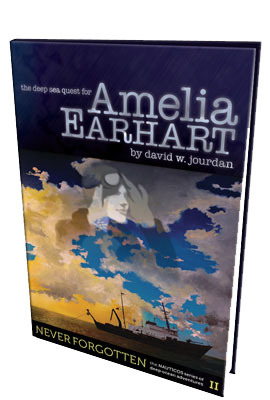 The disappearance of Amelia Earhart is possibly the greatest aviation mystery of the twentieth century. Amelia and her navigator, Fred Noonan, vanished without a trace in the vast Pacific near tiny Howland Island during their attempt to circle the globe on July 2, 1937. No wreckage, oil slick, or floating debris of any sort was ever found. Other than a few fleeting radio messages, there is no primary source to narrow speculation on their fate. Over the last decade, David W. Jourdan, founder of the deep-sea exploration company Nauticos, and Elgen Long, famed aviator and author of the book Amelia Earhart: The Mystery Solved (Simon and Schuster, 1999), have teamed with engineers, analysts, researchers, sponsors, and investors to begin the most extensive high-resolution mapping of the deep-ocean floor in history. During the course of this work, Jourdan and his team launched two seven-week expeditions, in 2002 and 2006, in a quest to find Amelia Earhart’s Lockheed Electra and put this mystery to rest. Locating such a small target in one of the deepest and most remote places on the planet was one of the most daunting quests ever faced by ocean explorers. It involved dramatic and sometimes life-threatening situations encountered over the course of weeks at sea, far from help or rescue. Deep-towed sonars were used to map underwater topography to one-meter accuracy over an area as large as the State of Rhode Island. Volcanic calderas, extensive ridge systems, and massive seamounts never before seen by humans were revealed as the team imaged terrain on earth’s final frontier. Deploying millions of dollars worth of equipment-spending a dollar every second-the expedition leaders and their supporters risked great fortune in the hopes of discovering an even greater historical treasure. The limits of equipment, endurance, nature, and even medicine were tested as the team pressed on. Order your autographed book for only $24, and save $10.95 off list price now!